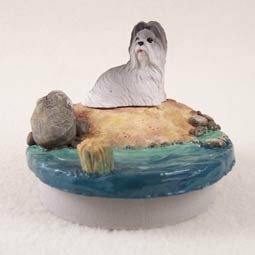 Conversation Concepts Miniature Shih Tzu Gray Candle Topper Tiny One "A Day on the Beach"
The Candle Topper "A Day on the Beach" features a breed specific hand painted miniature dog figurine on a sandy ocean beach, watching the water rush by. Something you might see at your local river or lake. Are there fish to chase, or seal to swim after? Looks like there could be! Designed to fit the standard jar candle with a 2 15/16" opening, this unique stone resin sculpture is sure to be the light of your life. Candle is NOT included. Makes a perfect gift! Perfect gift for the dog lover you know! View More In Candle Drapes, Shades & Sleeves. If you have any questions about this product by Conversation Concepts, contact us by completing and submitting the form below. If you are looking for a specif part number, please include it with your message. Conversation Concepts Miniature Shih Tzu Black & White Candle Topper Tiny One "A Day on the Beach"
Conversation Concepts Miniature Poodle Gray Candle Topper Tiny One "A Day on the Beach"
Conversation Concepts Miniature Poodle Apricot Candle Topper Tiny One "A Day at Home"
Conversation Concepts Miniature Poodle Chocolate Candle Topper Tiny One "A Day at Home"
Conversation Concepts Miniature Poodle Gray Candle Topper Tiny One "A Day at Home"
Conversation Concepts Miniature Poodle White Candle Topper Tiny One "A Day at Home"
Conversation Concepts Miniature Lhasa Apso Black Candle Topper Tiny One "A Day at Home"
Conversation Concepts Miniature Lhasa Apso Blonde Candle Topper Tiny One "A Day at Home"
Conversation Concepts Miniature Lhasa Apso Brown Candle Topper Tiny One "A Day at Home"
Conversation Concepts Miniature Lhasa Apso Gray w/Sport Cut Candle Topper Tiny One "A Day at Home"